I have a 4x5 (9x12cm) "Messraster" focusing device in a bought-new two year old Sinar P2 (see www.anstendig.org, the papers on focusing, for info). This rarest and most accurate of all focusing devices (it is probably the only large format Messraster still in existence) is mounted in a Linhof back that was adapted for the SinarP2's back by an East Bay shop, which was the only such place I could find with the precision and capability to do the job (Adolph Gasser Jr was sympathetic, but didn't want to touch the job). The back was originally mounted for me (when I lived in Berlin) in a rare French ILKO 5x7 camera's back...which camera I still own. It was the most advanced camera of its day, with a lens-standard suspension system that absorbs shocks and allows total movements, etc. Quite a device, but parts or accessories or lens boards available anymore. Focusing with the Messraster is absolute. It is very easy with faster lenses and takes just little bit more time with slower lenses, unless you have excellent young eyes, which I no longer have. A Messraster with slightly greater distance between surfaces would be easier to use with slower lenses. While this camera is fun when one has the energy to schlepp it around....or a few students to do that for you, I find myself almost not using it at all, because the new EOS-MK II with shift lenses, etc., can get most needs done much easier with adequate resolution......provided one uses only single fousing sensors and places them exactly on the most important image point/place. There are, however, some subjects that even that autofocusing system cannot manage, and which the Messraster can. So I still keep my old Nikon 35mm camera with messraster and the Sinar handy. High res digital backs for LF seem to have large-magnification focusing possibilities. But they are not all that handy, which the messraster is. Unfortunately, there is no cheap way to do accurate photo work with mid sized format. Second hand I am leery of, as the cameras are seldom well-adjusted depth-wise even when new. And the problem of mirror slap and such with midformat slrs daunts me. Even a tripod is no assurence of lack of movement. Going to larger formats has its drawbacks, too. With film, there are very few cut film holders with accurate depth....I haven't found any, except the ones that were adjusted for me for depth by the Messraster inventor back then. Maybe the super-high-priced highest end Sinar holders might be exact enough. But I wouldn't bet on it. Then there is film thickness, and film flatness. Big issues. So yes. there are quality improvements with larger formats, but less than proportional to the larger size. Far less. I have Linhof Ideal format shots that rival, in detail and everything else, 8 x 10 and larger formats, because the film lies flatter, the emulsions are thinner and better, and the lenses for that size format are generally sharper. Despite the demise of a few great films, the future of LF looks good. LF film is an economical path to top quality digital printing. One can start with an older second-hand LF camera and lens and a good flatbed scanner with LF transparancy adaptor. Careful shopping would keep the cost below that of entry level DSLRs. The soon to be released http://www.pcmag.com/article2/0,1759,1929360,00.asp and a newer LF outfit has potential far beyond that of MF and smaller cameras, and perhaps at a lower cost. Of course there is the conventional darkroom. LF enlargers are now a bargain. Older LF cameras and lenses need not be expensive. Quality prints are easy to produce, even with ancient equipment. The versatility of a view camera is unmatched by economical DSLR outfits. LF has advantages when using alternative processes. LF gear does have disadvantages. For snapshots, wildlife, and sports a DSLR is clearly better. LF requires more thought and physical energy. I often use 35mm film for convenience. I even use a cheap digital camera for a few purposes. For versatility and quality, i much prefer LF. For image quality, yes, LF has it all over today's digitals. Verastility is debatable; LF and smaller formats are good at different things. You may even be able to get into LF at a much reduced initial cost than small format, but there is a big difference between initial price and the cost of ownership. Operating cost of LF is definitely not one of its advantages, especially on a per-exposure basis! At this point, only LF view cameras offer the ability to adjust the focal plane which is a huge advantage in lots of situations. Photoshop can reasonably handle perspective control within limits, but no software on the planet can mimic a movable focal plane. LF as we know it, that is 8x10 and 4x5 film, will yield to digital imagers as the price/performance curves converge... but view cameras are here to stay. Small, purpose built, digital view cameras are starting to emerge but no complete systems exist yet. This is where I believe LF is going. Even the state of the art Phase One P45 back (39MP!) has an imager that's smaller than a 645 film frame. The smaller view camera bodies will be harder to focus but I'll wager they will ultimately be closed back and shot tethered with digital focusing aids. 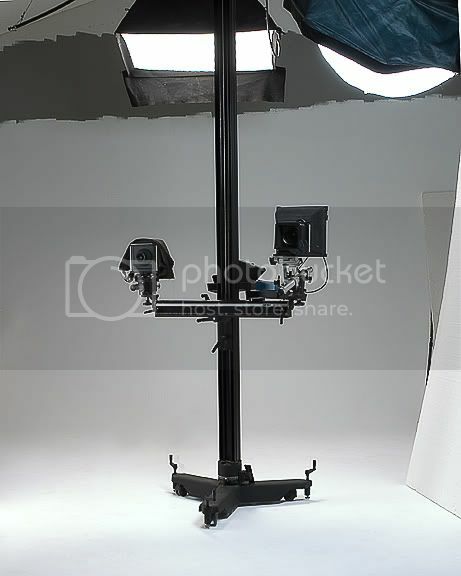 Imagine a robotic view camera system integrated with a robotic studio stand! That would just be too cool. Shoot your camera with something like a PS2 controller while you watch the preview on a monitor, zooming, panning and checking the details as you go. As for film, it will probably take a sudden downturn at some point. The newer imagers have HUGE dynamic range, much more than negative film. It's possible to capture a 10 zone image right now... not that you can print or display it... but that's never been possible with film... it will ultimately change exposure as we know it. A 39MP imager will produce an image that can be upsampled 2X and printed artifact free at 8' on the long edge! The best drum scan from an 8x10 will clearly show big grain and other film scan artifacts at that magnification... artifacts that simply aren't present in digital captures. With luck and some demand from the market, compact, portable, digital view cameras will emerge and our children can grow up to be old landscape photographers without ever knowing the pleasures of back surgery, sciatica and scoliosis. To me LF and view cameras are tantamount... and the future of view cameras hasn't really even begun to get interesting. Big things are ahead. Small, purpose built, digital view cameras are starting to emerge but no complete systems exist yet. Not true. I shoot with Sinar systems almost daily at work! Sinar 4x5 body(s) with sinar digital backs. This is where I believe LF is going. Even the state of the art Phase One P45 back (39MP!) has an imager that's smaller than a 645 film frame. The smaller view camera bodies will be harder to focus but I'll wager they will ultimately be closed back and shot tethered with digital focusing aids. That's very cool. I looked at the P3 when it was emerging but didn't grasp that the body was compact. Without a doubt, Sinar is a true system camera... if not THE true system camera. Alas, I still shoot an F2... and I love it. Don't use it as much as I used to though. I switched to LF 4-5 years ago & haven't looked back. Used 35mm for years & tried digital which was totally boring. Cameras are a way of exploring the world, and LF's image size & pace are enjoyable aspects of that exploration. And thanks to the internet, I can find suppliers for all my needs as well as share info with like-minded individuals. The LF future is looking very bright to me. I am primarily film based. I shoot 35mm, medium format (6x7 and 6x9cm), and large format (4x5 and 8x10 inch). I also shoot with a digital camera.